Okay, so I miscalculated! Six doesn’t fit neatly into five, but that’s the beauty of the “ish.” I had a sneaking suspicion that I’d get a little longwinded, so I covered myself with the all-purpose “ish.” No promises, but my new best guess is 7ish. We’ve been doing a passage perusal of the oft repeated command to “Love our neighbors as ourselves” from Moses to Jesus to Paul and now to James. If you’ve been following along with each post, you’ll undoubtedly have noticed that the “neighbors” referred to in these passages are people who come from everyplace on the planet and will include, not only those who look and act the same as us, but those who are quite dissimilar from us. I’ve made no secret that we Christians have a responsibility to rethink, in light of Scripture, our view of the discarded dregs of our own society as well as people who come here from other places fleeing from bone crushing poverty and/or brutally oppressive regimes. Though our neighbors live near and far, this is the aspect of neighborliness I felt compelled to highlight. I admit my grief about many of my fellow Jesus followers who seem to hold too narrow a definition of “neighbor” and carry little to no sense of duty for hospitality to our international neighbors. As I said before, I began this interminable essay well before President Obama made an executive decision to let millions of such neighbors off the hook of the status of the illegal, much to the displeasure of many conservatives. Detractors cite disastrous anecdotes that, to their minds, prove it a bad decision, while others will try to balance the scale with examples to the contrary. I know a few stories of my own that prove both sides of the aisle of the debate, but I prefer the simpler route and ask the Bible for answers. By answers, I don’t mean microwave-quick solutions to the politics involved. I personally don’t have the brain cells to disentangle all the threads connected to the issue, but along with Mother Teresa, I beat no political drum. As I don’t think of this as a political, but a humanitarian issue I choose to not wander outside my particular assignment and try to do political commentary, but I do try to be more influenced by the Word than by my personal preferences. My point is that we Christians have a biblically mandated moral obligation to love neighbors, and regardless of our political leanings, we should lean in the direction of a biblical worldview and not just what seems to benefit us in the short run. My challenge is that we have our thinking shaped by Scripture instead of by our self-centered inclinations or partisan allegiances. Of all people on the planet, we with biblically informed consciences should insist on a value for hospitality and find ways in which we can practice neighborliness in spite of the messiness. We could go on and on about the particular opportunities we have to show God’s love to our neighbors, but to the extent that we see the boundaries of our neighborhood reaching beyond the few blocks that surround our own house and to the degree that we actually care about what happens to people outside our club, culture, or country; we are loving our neighbors as ourselves. 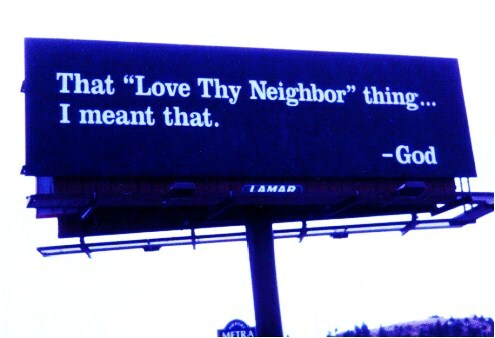 Let’s get back to the Bible and the final appearance of the “love your neighbor” command. James dubbed the law of love for neighbors, the “royal law.” It makes sense since it was issued from the King as a royal edict to his subjects. It’s a law of royal proportions and not to be dismissed as one of lesser consequence. It’s James’ way of saying that, besides loving God with all your heart, loving your neighbor as much as yourself is the most important of all the commands. He describes a regrettable, and hopefully entirely hypothetical, Sunday scene at the front door of The First Church of People Just Like Us. Loving our neighbor includes a ban on playing favorites based on social standing. Moses commanded us to love our enemies as much as we do ourselves. Jesus said we’d find neighbors even among our enemies. Don’t do your neighbor any harm and humbly serve him/her, said Paul. Now James warns against holding a hierarchy of neighbors based on socioeconomics. Keep in mind that James grew up in the same house with his half-brother Jesus. Can’t you just see Jesus bringing people home for dinner every night ­– not so much his buddies from soccer camp, but widows and orphans that he encountered in the market? We usually think of Jesus as a child healing sparrows and multiplying breakfast cereal, but I muse about him reaching out to the unwashed and un-housed. Please feel free to use your own Spirit-inspire creativity and pose any honest disagreement with me. Oh, and I think there will be just one more post on this, which will make it 7 or 5ish. Quit complaining, it could’ve been 27!